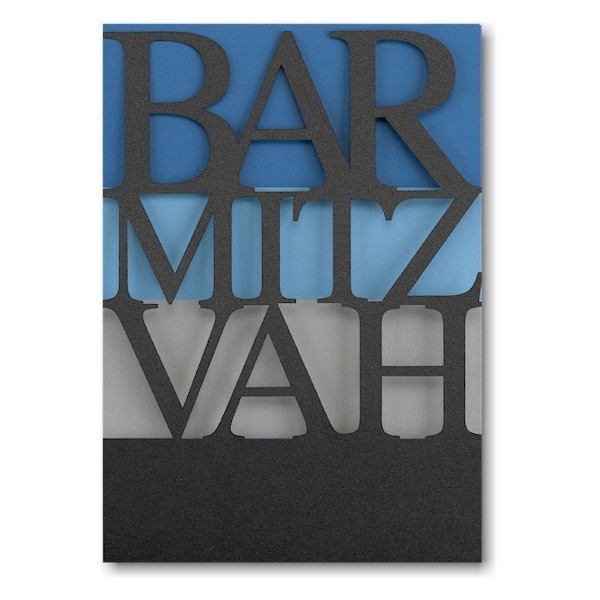 This modern Bar Mitzvah invitation features an outer, bottom folding wrap in Black Shimmer card stock which has been laser die-cut into “BAR MITZVAH” to reveal the colors of royal blue, sky blue and grey on the folding invitation inside. This modern Bar Mitzvah invitation features an outer, bottom-folding wrap in Black Shimmer card stock which has been laser die-cut into “BAR MITZVAH” to reveal the colors of royal blue, sky blue and grey on the side-folding invitation inside. 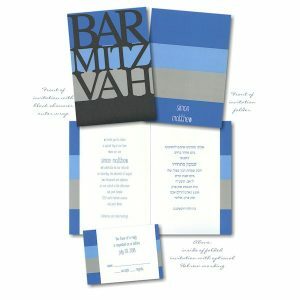 The Bar Mitzvah’s name appears on the bottom front of the invitation folder, and inside your wording details print in up to 2 ink colors on the left side. 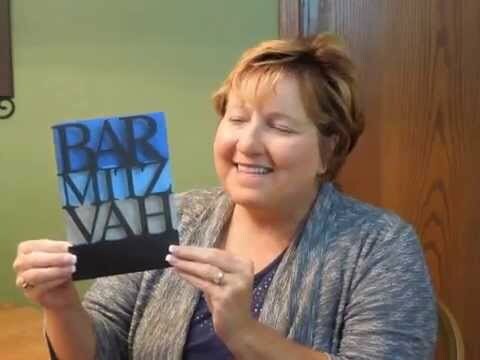 An optional verse, prayer, reception information, or optional Hebrew wording may be printed on the inside right. Full Hebrew wording is available at a cost of $125. If interested, please contact customer service for ordering instructions. Measures 5-1/2″ wide by 7-3/4″ high. Shown with flat blue and sky blue inks and lettering style QDR. The Reception and Response enclosures print on coordinating single card stock, and the Informal notes print on folder stock with matching vertical color bands on the front along with the name of the Bar Mitzvah. This Bar Mitzvah invitation is accompanied by single bright white envelopes. Please note: Customer assembly is required.